This rug is so Gorgeous! It really brightened up my day and my living room! 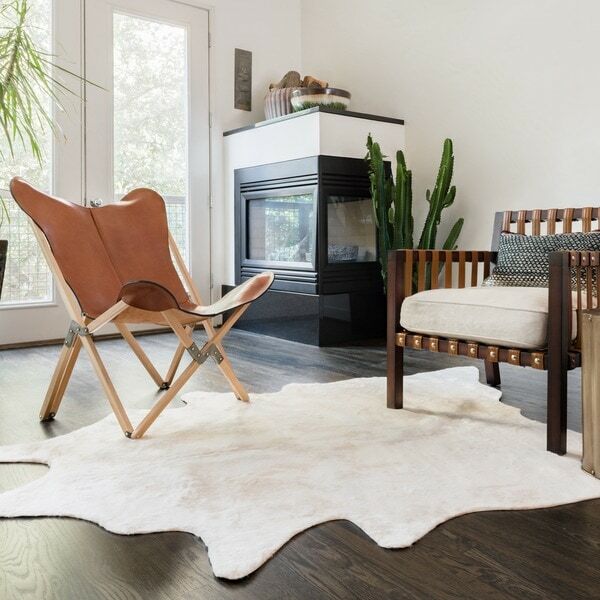 This stunning, rustically inspired rawhide ivory rug is machine-woven, which gives it a strong, resilient weave that's ideal for living rooms, saloons, and other high-traffic areas. It's made entirely from durable synthetics, rather than from animal products, so you can enjoy the look and feel guilt-free. The rug is everything I hoped for. Super soft, thick, not shedding, light cream color, arrived quickly and fits the small room well. Do not buy it because I want to get another and I'll be sad if it sells out. It’s a really nice piece that fits in our living room. The color is as appears In the photos and feel is very soft and aesthetically pleasing. Size was accurate. Love this rug. Be aware that it is thin and you may need a pad to keep it in place. I use it for a transitional rug from my entry way to my living room. Nice rug! The color is Ivory as shown. The perfect size to layer over a larger rug. Also very easy to clean. 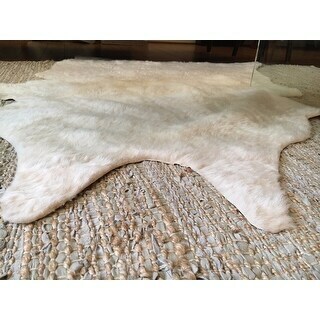 I love the look of my new Cowhide rug. We have a rustic modern style home. 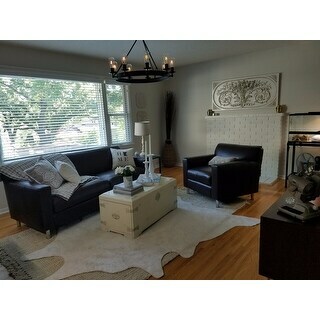 This adds just the touch of the rustic feel that I was looking for but yet not too much with the ivory color. Perfect!!! I love the color and size! 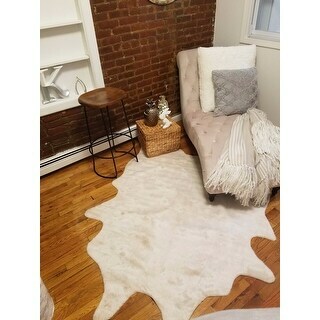 I absolutely love my faux cowhide area rug. It was the perfect size for my living room and gives the space a little panache! It took a few weeks to completely flatten out but is now just right. If you are looking for a piece to complete your look - I highly recommend it. Great price too! I have been looking for a beautiful rug for my living room and this is definitely the one! It's unique and large enough to really make a statement within our room. I love the ivory color as well as the cut. Of course, when you initially receive the rug, you'll have to place an object on the edges to make it lay flat due to it being delivered rolled up. I only had to do this for a day or so. All in all, I LOVE this rug! Such a beautiful rug! The color, size and shape is perfect. It’s super soft and excellent quality. Very happy with my purchase and would highly recommend this rug! Perfect rug to add texture to a room and contrast to dark hardwood floors. 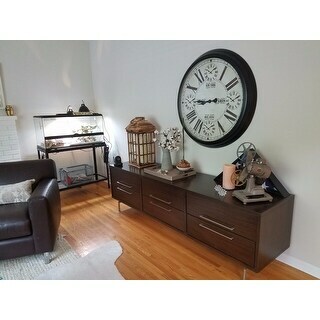 It fit perfectly under the coffee table and is great looking for such a reasonable price. As a vegetarian, I was looking for a light-colored faux fur rug, and this one fit the bill. It's fuzzier than I thought it would be, but that's ok. It looks great layered over my bleached jute rug. I would buy another one. Good price and fast shipping, too. This rug looks close enough to the an actual hide to really work. I wanted something easier to maintain, and this certainly is. One of my dogs has already "christened" it (ugh), and it cleaned up beautifully (I put a bowl underneath it and poured a mixture of water and vinegar through it, then left it propped up to air dry). I think it says you can machine wash it, though I'm not sure I'd try it. In love with the rug! Love this rug it's Just like the photograph ! I got the medium size (5' by 6.5)? And it's so soft and adds so much character to my living area ! I ordered faux, received faux and I LOVE it! This rug is everything I wanted and more. It's so much more than a hide. It adds texture, softness and comes with all the ease of a synthetic rug. I was afraid it wasn't going to be big enough for my space but I have to say, I think it fits just right. Highly recommend. This small hide is totally soft, and works great layered on top of our scratchy jute area rug in front of the sofa. The color is a perfect, creamy off-white. Cream in color. Looks fantastic in my office! Love! Looks great in our room. It’s not wearing well- definitely looks fake. Love this. 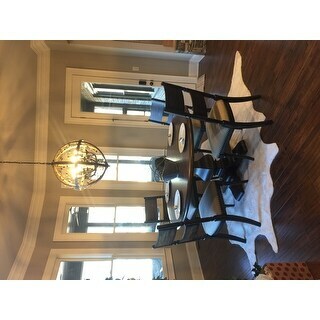 I layered it over a natural fiber rug and it is beautiful! I also run the vaccum right over it to clean! Looks good at first. But overtime (after 6 months) starts falling apart. Arrives wrinkly but I think that will get better with time. Color is perfect! For some reason I expected this to have specs of gold in it and it didn't. 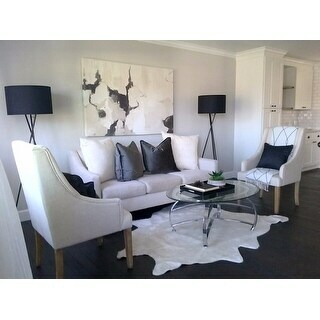 It's just a faux ivory/cream colored cowhide rug nothing to write home about. "What is the actual care/maintenance of this rug?" "Hi, can you tell me the weight of the package? Thank you"
The shipping weight is 4 ponds. "I love this rug and would like one similar for high traffic. What do you recommend?" This rug does well in high traffic. My son spills his food all over it and it’s fine. It washes well in the washer too. My dog has accidents on it all the time. It’s brand new when it comes out the wash though not as soft and shiny. "There seem to be discrepancies in the answers I see here about the color of this rug - is it pure ivory or does it have faded spots? If someone at Overstock could please clarify I would appreciate it." It is ivory but has slight touches of a golden hue. In my opinion, that adds to the aesthetic appeal. Its definitely not for high traffic areas. It sheds but not horribly, but I can imagine that it might wear out quickly in an entryway etc... I have it under my piano and think it works perfectly. It is thin, which I wanted, and is an ideal, accent rug to create that certain look. Buy it more for its looks than functionality. "Can you vacuum this rug safely?" Yes I vacuum it all the time since I have a dog in the house. "I just got this and it isn't laying flat. There are all these ripples in the middle that pop right back up when you try to smooth them out. Does this thing flatten out over time?" I have two. Mine get kicked up now and then but they do lay flat. Maybe you should put some heavy books over them? Or I wonder if you could iron the underside? Mine flattened out after a few days. I have found that using a small handheld clothing steamer helps. Don't hold it on the rug, but allow steam near the back, then lay flat with something heavy on it. Worked well on other rugs I have that had this problem. "I cannot get this rug to lay flat. It bunches up in the middle. Has anyone else had this problem? Wondering if there is a trick to flattening it or if mine is defective.."
Mine was kind of "ripply" in the middle but over time walking on it and vacuuming it, it got better.